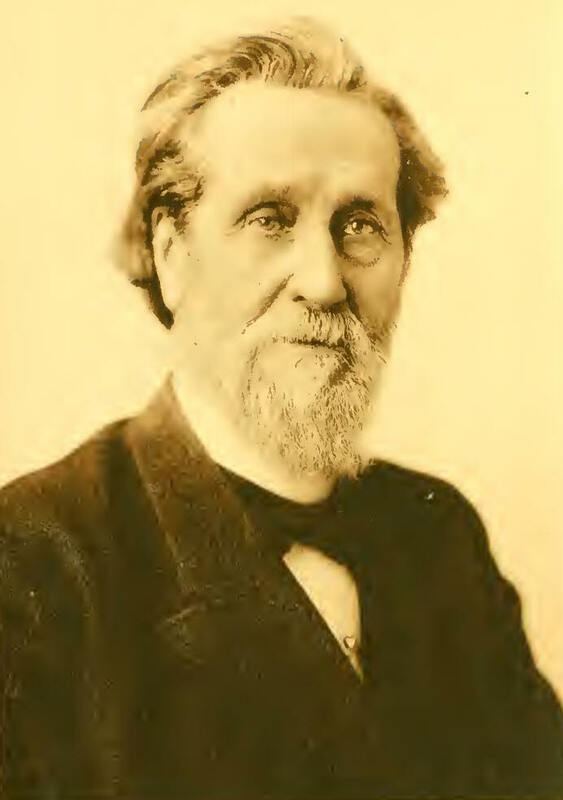 Born in Fredericton, New Brunswick, Isaac Stephenson (1829-1918) followed his interests as a lumberman, sailor, and entrepreneur to Bangor, Maine and, later, to the northern woods of Wisconsin. In 1858, he purchased a one-quarter interest in the North Ludington Lumber Company in Marinette and went on to become that community's leading citizen. He founded the Stephenson National Bank, donated the Stephenson Public Library, developed the town's retail and commercial district, and used his involvement in local politics as a springboard for state and national office. Stephenson served in the Wisconsin State Assembly (1866-1868), as a U.S. Representative from Wisconsin (1883-1889), and also as a U.S. Senator from that same state (1907-1915). An active participant in the "Half-Breed" faction of Wisconsin's Republican party that supported Huagen and La Follette in their races for the governorship, he began publishing the Free Press of Milwaukee in 1901 as a means of conveying their reform-minded views to the public. In the Senate, La Follette and Stephenson soon found themselves differing over issues of patronage and efforts to eliminate graft and purify the political process. Stephenson had little interest in a national political agenda. Although much of his autobiography deals with his civic and political life, its first half provides inside perspectives on many aspects of the logging industry and life in the logging camps. There is also considerable information on local Native American groups, especially the Menominee, and the folklife of occupational and family groups in the rapidly developing areas of the Upper Midwest. IN undertaking to set down, so that others may read, the recollections of my own personal experiences during three-quarters of a century or more, it is not my purpose to trespass upon the field either of the historian or of the commentator by attempting to interpret the events which came directly or indirectly under my observation. Nor is it my purpose to point a moral. What I have written is no more than a concise narrative of what befell me, of the difficulties I encountered, the disappointments I suffered and the triumphs I achieved, the fortunes and misfortunes that were dealt out to me by my controlling destiny. There are few men living who have had so varied, certainly so long, a career as I. It is a far cry from the agitation over the northeastern boundary controversy in 1839 to the vicissitudes of latter-day politics in 1915. Many things have happened within that spice of time. The greater portion of the country has been transformed from a wilderness into a cultivated and settled area. Railroads have intersected it; cities have been built; and its vitality has awakened to the pulsations of a highly organized commercial life. In that epoch of progress I moved as an individual with the flowing stream, but I no less than the others have seen something of the changes that have been wrought, the decay of old customs and the growth of new, the succession of problems from meeting the rigors of the wilderness to the adjustment of social and economic relations in the complex civilization of to-day. If this viewpoint from a lengthy perspective will enable anyone who may read to measure with greater accuracy of vision the advantages and disadvantages of the shifting present, I shall count what I have written as of some value. The migration of the lumbermen of the Maine and New Brunswick forests in the early part of the last century the greatest center of the industry in the world - is one of the interesting phases of the pioneer period of American history. They blazed a way with restless energy into the timbered wilderness of Pennsylvania, of Wisconsin and Michigan, of Minnesota, of the mountain region of the far West and finally finally of the Pacific coast. From ocean to ocean the tide has moved within the span of my own lifetime. A part of that course it was my lot to travel. I journeyed from Maine to Boston by sea, from Boston to Albany by train, from Albany to Buffalo by canal-boat and thence over the Great Lakes, the main thoroughfare from the expanding West, to Milwaukee before the railroads extended beyond Buffalo and many of the great cities of the country were more than a name. Of the early settlements along Green Bay and the northern peninsula of Michigan struggling for foothold on the verge of what seemed to be almost illimitable forests I have watched the growth, and the wilderness I have seen melt away before the encroaching stretch of farms. My experiences were, in large measure, the experiences of those who set the pace of achievement under these conditions. I worked with them exploring the forests, in the logging camps, on the rivers and at the mills, and sailed with them on Lake Michigan as seaman, mate, and master. Favored by circumstance, I covered wider fields than most of them. From the time I fell under the eye of my mother's cousin, Christopher Murray, at Murray Castle, Spring Hill, New Brunswick, when I was four years old, it was my good fortune to attract the attention and enjoy the confidence of many men. I came to the West as a member of the household of Jefferson Sinclair, the greatest practical lumberman of his time; was associated in business with William B. Ogden, at one time mayor of Chicago, also one of the towering figures of his day; and numbered among my friends Samuel J. Tilden and a host of other men of large affairs - lawyers, railroad builders, bankers, manufacturers - who set the seal of their energy upon the broadening destiny of the country,—pioneers, no less, of their kind. By reason, no doubt, of the knowledge I had gained of conditions in northern Wisconsin and Michigan and the training I had received at the hands of Mr. Sinclair, a score of offers of employment were made to me by men who desired me to take charge of lumbering, mining, land, and railroad-building enterprises. It is possible, therefore, that some idea of the difficulties these men encountered and the ordeals through which they passed may be gathered from this narrative, although it is a purely personal one, my own story told in my own way. Whether a comparison of the present manner of living with that which prevailed in those early days would point the way to reforms I doubt much. Changing standards offer a cloak for lapses from hard-and-fast rules of conduct, and the judgments of one generation are held not to apply in another. None the less the necessity which confronted these hewers of wood and drawers of water was a wholesome stimulant. The long days of hard work bred sturdy, if not facile, character a lesson which no age is too advanced in wisdom to learn. In this time of social and economic readjustment it might be well to remember that their achievement was due to industry and thrift and that the opportunity which looms large in retrospect was less apparent in their immediate environment than that which the future now seems to hold. Too often, as I see it, the background of toil and struggle is left to hazy outline while the results of their labors are blazoned forth in vivid colors. Accordingly is the measure of their compensation exaggerated and the extent of their effort minimized. What allurement did the prospect of an isolated wilderness possess for those who turned their faces westward? The prairies stretched for almost countless miles to regions unmapped and unexplored. The pine forests had no bounds. With such abundance mere possession availed nothing. The only wealth to be obtained was wrested from them by grinding labor; and these men labored from dawn to twilight, valorous, undaunted, and unafraid. I have seen this period of construction pass and the chief function of government change, for the moment at least, from the stimulation to the regulation of effort. In the cycle of progress and growth of a country so blessed with abundance as ours, this, no doubt, is necessary. Adroitness has in too many cases been made to serve the purposes of toil. But in the light of the philosophy of my own experience I should choose my steps carefully lest I put upon honest effort an unnecessary burden or take from it its just reward. Progressivism and reform are a resonant shibboleth. I should demand from those who cry it other credentials than a loud voice. Whether, when viewed from the perspective of a hundred years hence, it will be observed that greater progress was made in the earlier years of the nineteenth century than in the earlier years of the twentieth, I shall not presume to predict. I only hope that progress has been made, is being made, and will continue to be made without let or hindrance and that the problems of life will be met and solved as they arise, to the happiness and contentment of human kind. ISAAC STEPHENSON.